It's that time of year again--Back To School! I created this Back To School Resource Packet to supplement the many theme activities on my Back To School Theme Page. The goal of the first few weeks is to help them to become comfortable with their classroom, their teachers and their peers. 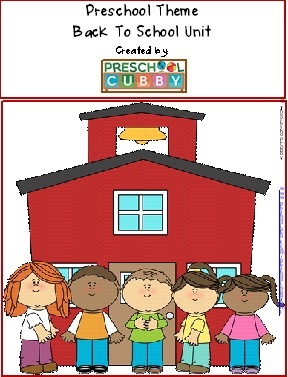 This Back To School Preschool Resource packet is filled with activities, ideas and preschool lesson plans your interest learning centers including Circle Time, Art, Blocks, Cooking, Dramatic Play, Easel, Gross Motor, Math & Manipulatives, Sand & Water Table (Sensory Play), Science, Writing Center and Story Time suggestions for each day. 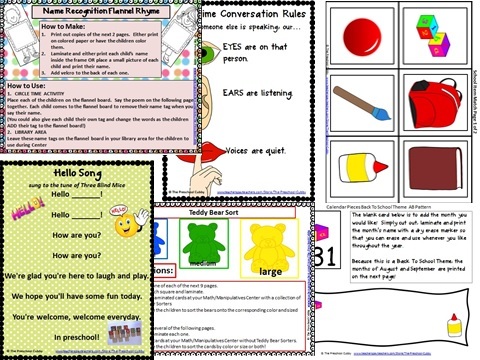 The Daily Lesson Plans include detailed plans for each day which include an activity for: Circle Time, Art, Math & Manipulatives, Science, Small Group, Gross Motor, Music & Movement and a Story Time Suggestion. Calendar Pieces for the month with an AB pattern of school items and month tags for August & September and a blank tag for you to fill in the month you begin school in! School Item Match Game with instructions of suggested games to play using them. An Apple to Take Home Art Activity with printable pages for the activity. Teddy Bear Sorting Cards for use with your Teddy Bear manipulatives. Teddy Bear Patterning Cards for use with your Teddy Bear manipulatives. 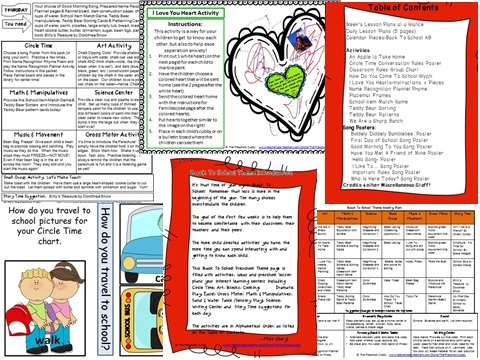 How Do You Travel To School--printables for a Circle Time Chart activity as well as an 8 1/2 X 11 printable chart for small group instruction. I Love You--Heart Activity with family involvement pieces and instructions. Go to the Preschool Plan It Store Main Page to see other Resources Available!